The last news about Igor. It's alive! Alive! Watch the trailer. This year, adventure will be re-invented! The CGI in Igor is maybe not the most advanced we may have seen, but the nice plot and the vivid characters help to forget this flaw. The Weinstein Company is rather opportunist in their new interest in CGI animated movies: they smartly try to go where money is. 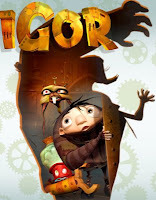 Igor is an upcoming CG animated comedy movie that should be released in September 2008. John Cusack will gives his voice to the main character of the plot, Igor himself. No more Yes Master! Igors of the world: get up, stand up, stand up for your rights! All men are not created evil: hopefully! 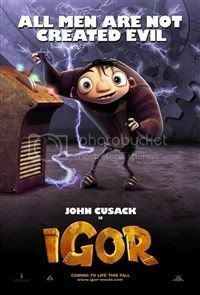 But John Cusack is giving his voice to Igor... Does it make Igor a little evill then? 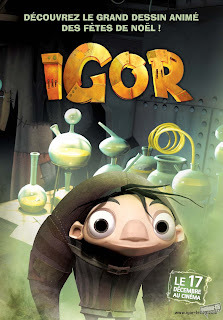 Igor is a CGI movie produced by the Weinstein Company and directed by Tony Leondis.